Jamaica! Oh Chanel, that is exciting. 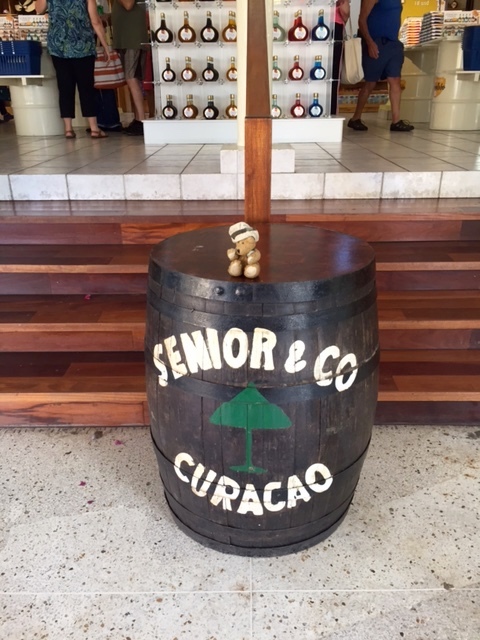 This duck has never been to Jamaica. Mom said Jamaica, a Caribbean Island was colonized by the British and the island is beautiful. Jamaica has mountains, rainforests, great scuba diving and wonderful snorkeling. 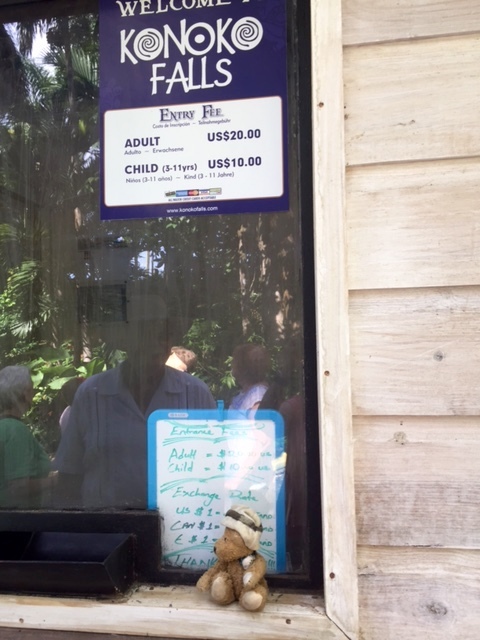 Here you are, entering Konoko Falls and Park. This beautiful area is in the Hills of St. Ann, overlooking the tourist area of Ocho Rios. 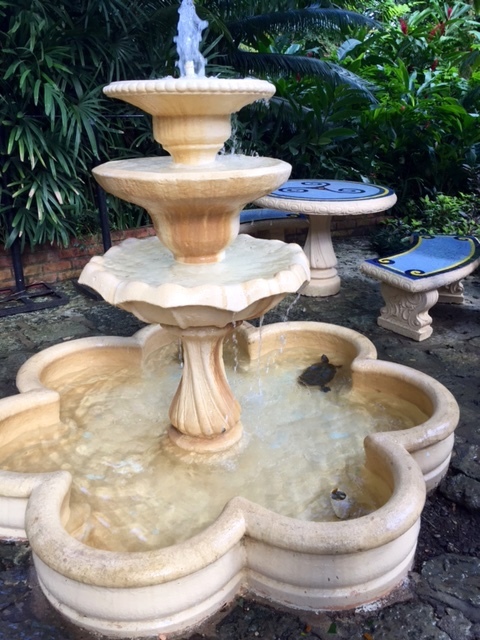 Your photo of this beautiful fountain shows a turtle in the water. We love to see turtles. Jamaica’s first people, the Taino Indians settled in this area. Be careful Chanel, that man has something on his shoulder. A really huge iguana. The tropical landscape is breathtaking. Thank you Chanel for these photos. 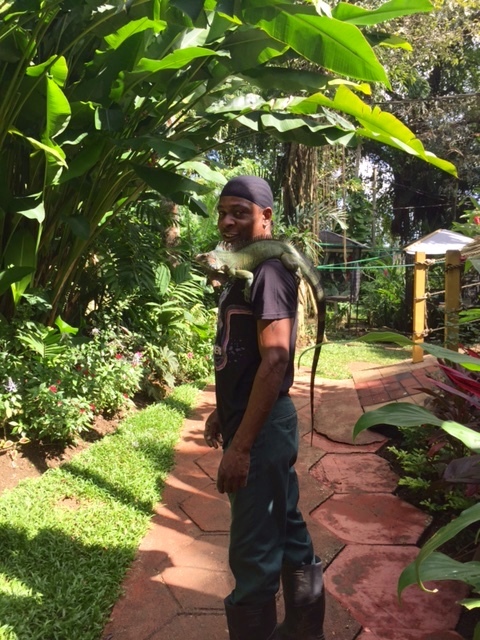 Jamaica looks beautiful and it seems that you had a great time there. 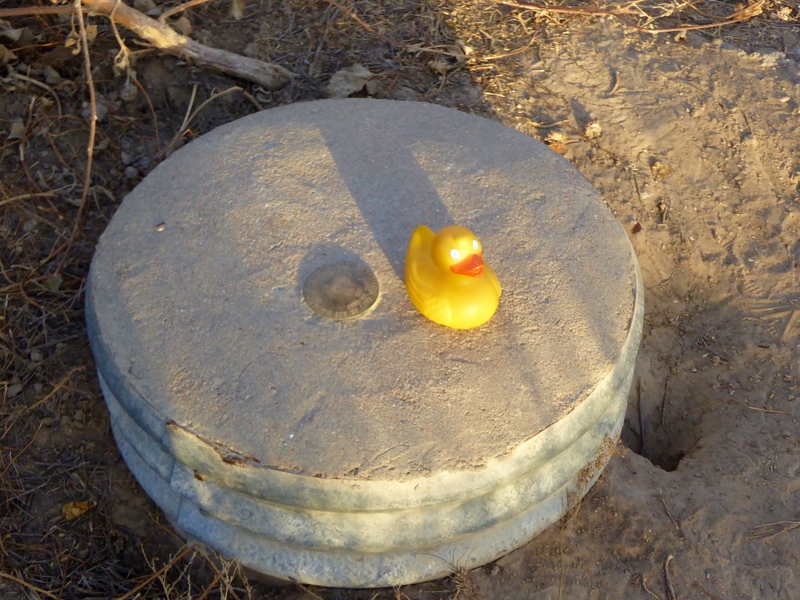 I, Zeb the Duck, hiked around the lake. I saw migratory birds. I enjoyed the mountain backdrop, and I was in the middle of the city. 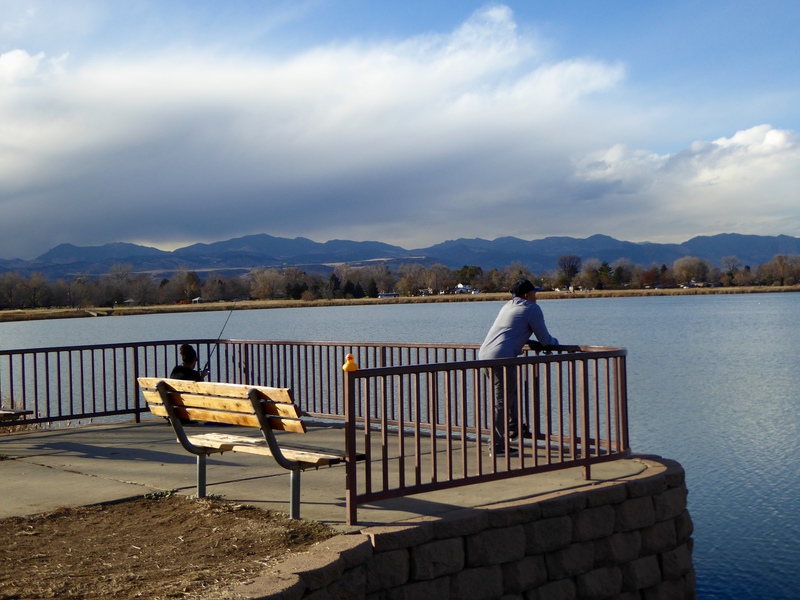 Jefferson County, our home and just west of Denver, has an Open Space Program, which is similar to a park system. 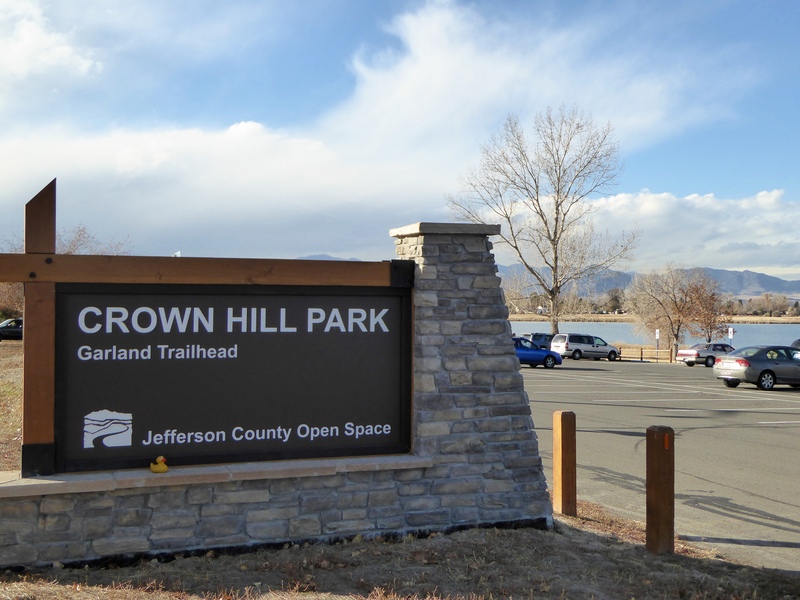 Today we went to Crown Hill Park in Jefferson County Open Space. 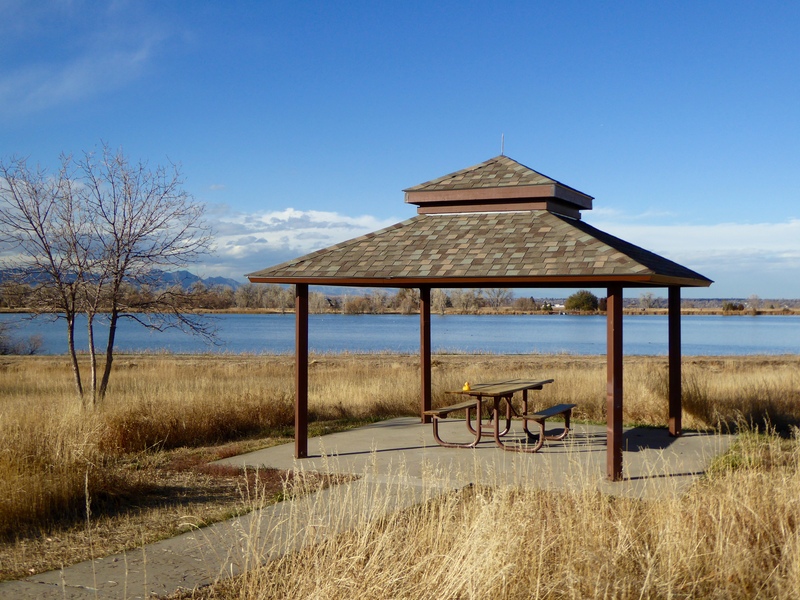 Within minutes we found this protected picnic area. 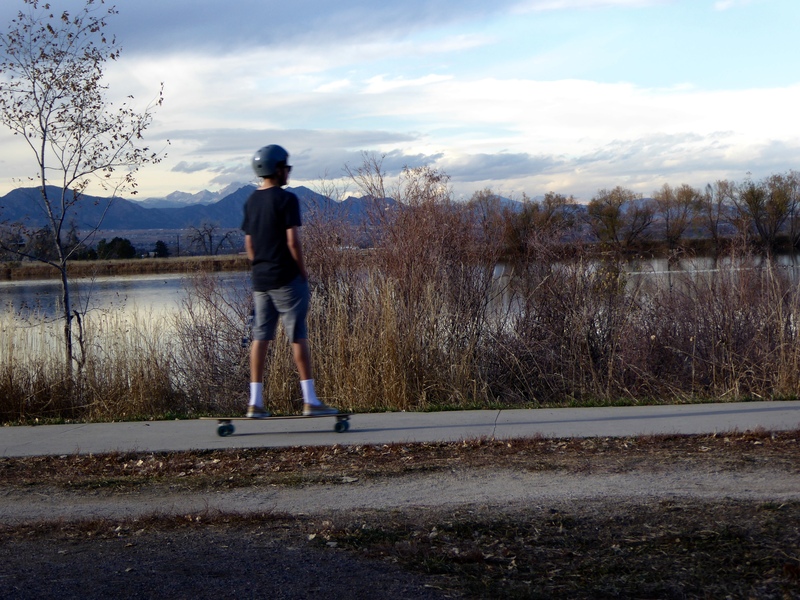 I love the lake and the mountain views. Humans come here for many reasons. 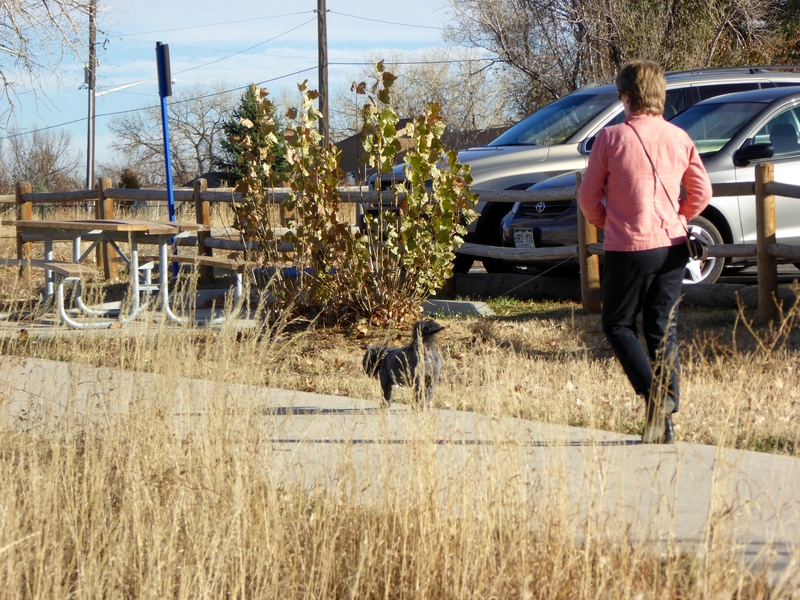 This human is walking a dog. Dogs must be on a leash here and of course, humans clean up after their dog. These humans are fishing and enjoying the lake. The clouds coming over the mountain verifying the weather forecast. A storm is moving in and we may receive snow tomorrow. 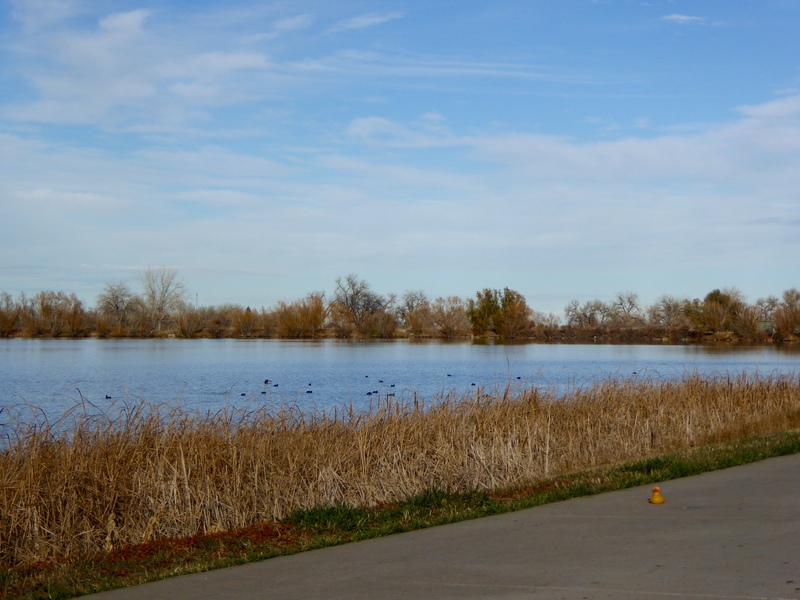 There is a 1.2 mile paved trail around the lake. Paving makes it wheelchair accessible, so everyone can enjoy this space. Some humans come here to skateboard. Some humans come for exercise. This man is jogging around the lake. He passed me three times. For those that want a little more wilderness feeling, these miles of dirt paths are available. Some humans and ducks come to walk and view quiet scenes like this. 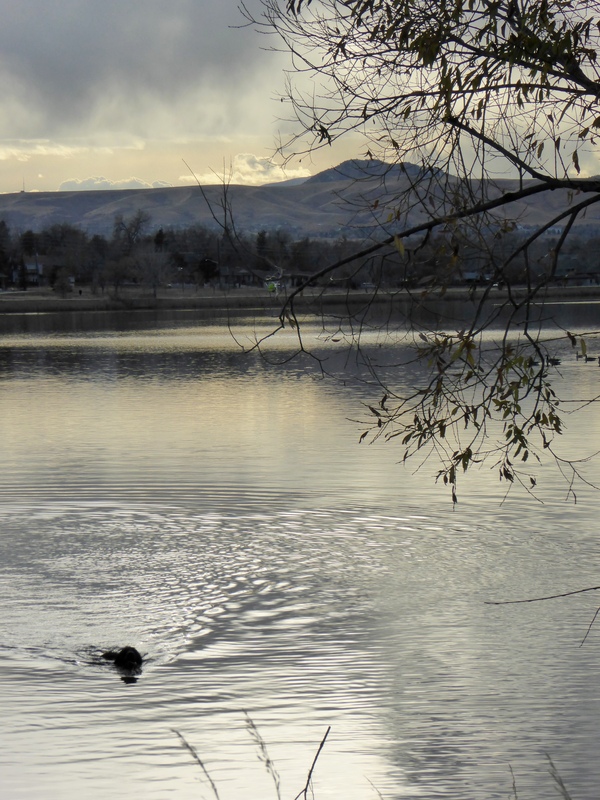 Here a human threw a stick in the lake and his dog is enjoying a swim to bring it back. Humans are not allowed to swim or wade in Crown Hill Lake. 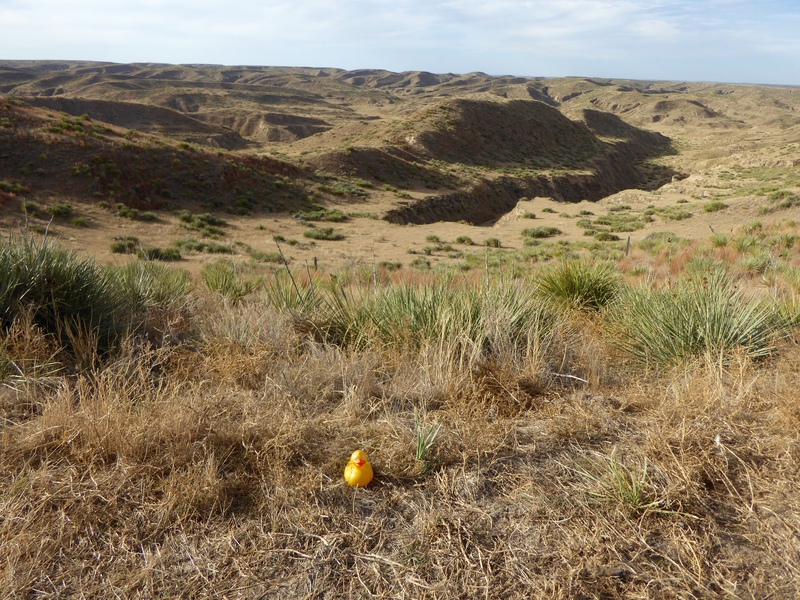 The northwest corner of this area is a Wildlife Sanctuary. 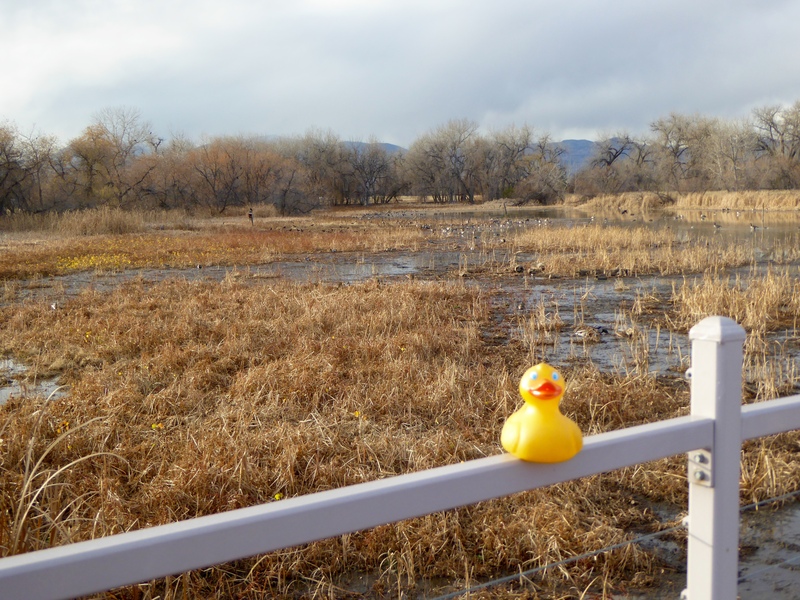 We eagerly go through the gate and watch many migrating birds on Kestrel Pond, the wetlands. 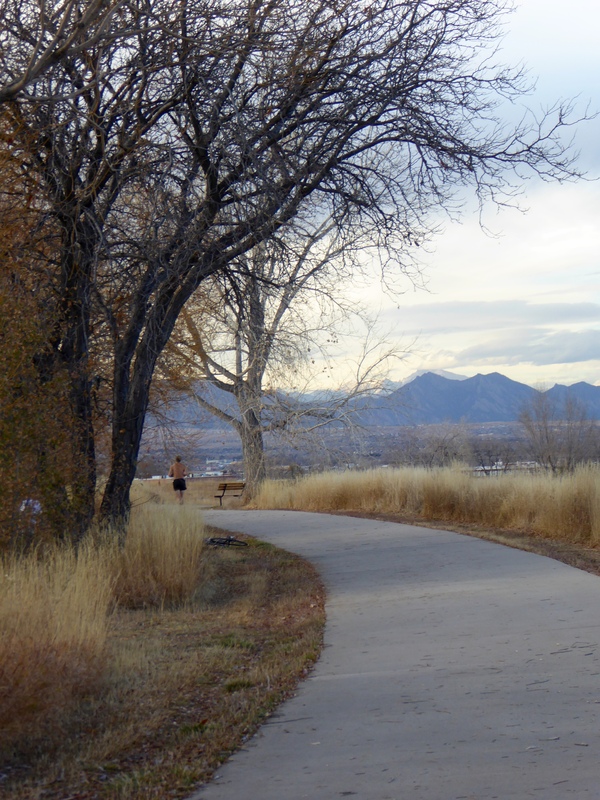 Following the many paths, we remember that this area is also certified as a National Urban Wildlife Refuge. 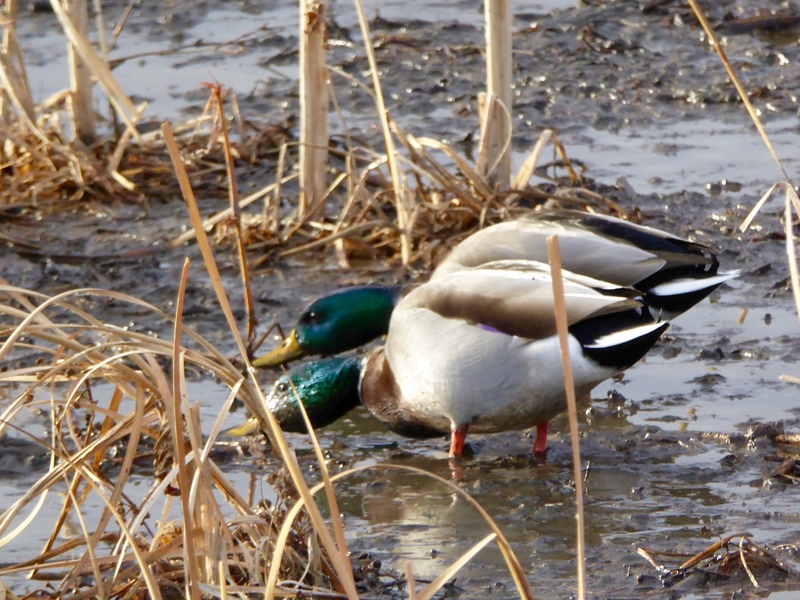 Kestrel Pond area earned that designation for its value to a variety of migrating waterfowl. There are always so many birds here. 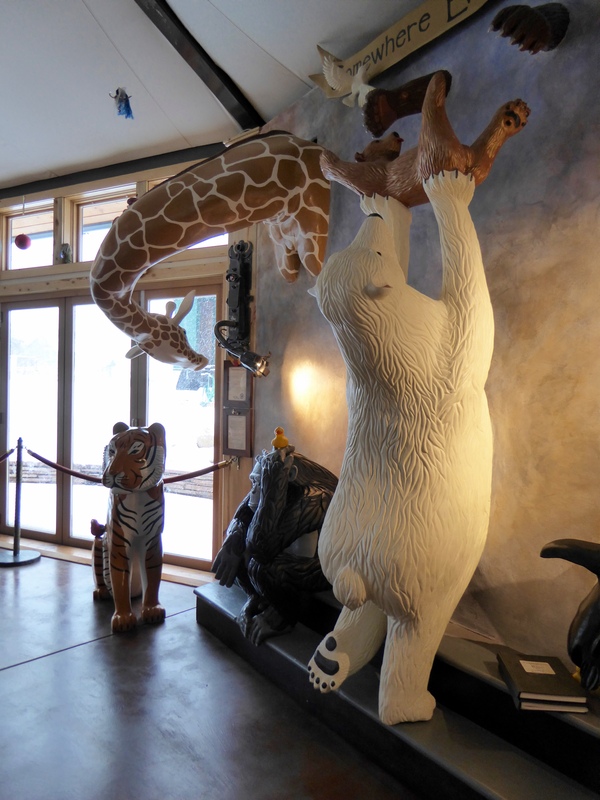 The Wildlife Sanctuary is only open to the pubic from July 1 through February 28. It is closed during the mating season to protect the wildlife. 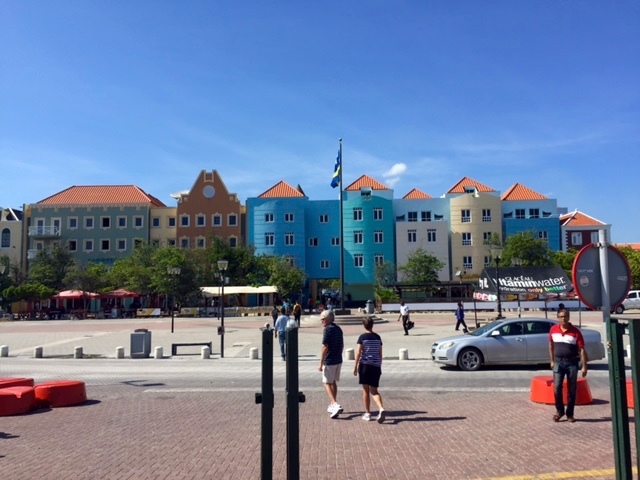 We liked all the birds, but the colors here grabbed our attention. Dogs, skateboarders, and bikes are never allowed in this area. 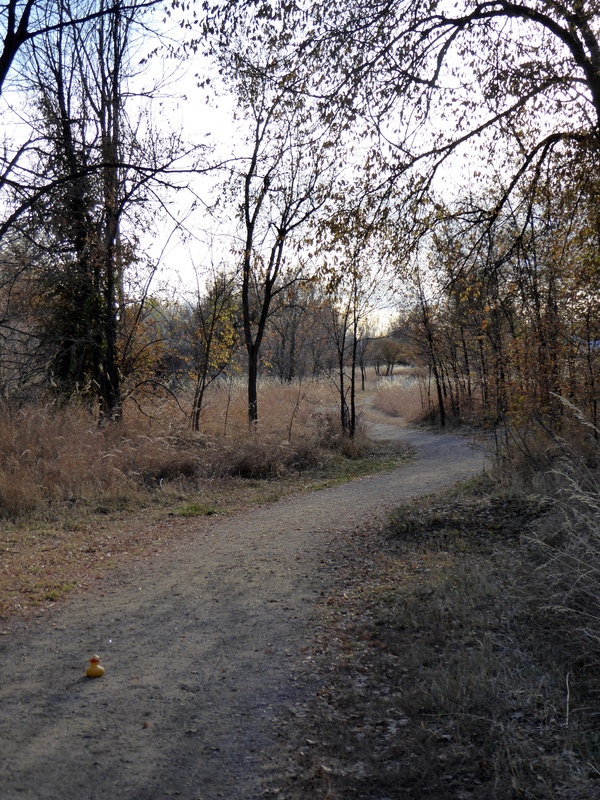 These 242 acres contain 10.1 miles of trails and are located between two major streets. But the feeling of peace and serenity is strong. 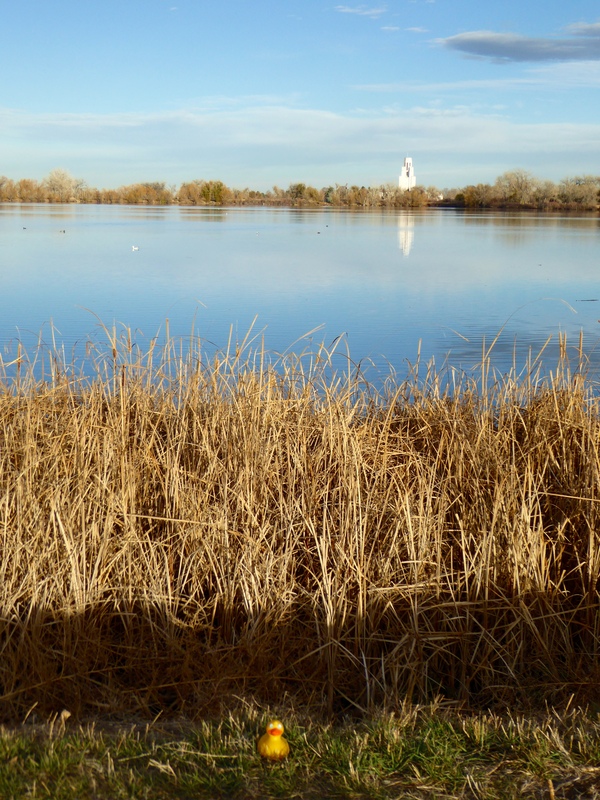 Directly east of Crown Hill Lake, is another huge area of peacefulness. Across the lake, we see the Tower of Memories from Crown Hill Cemetery. 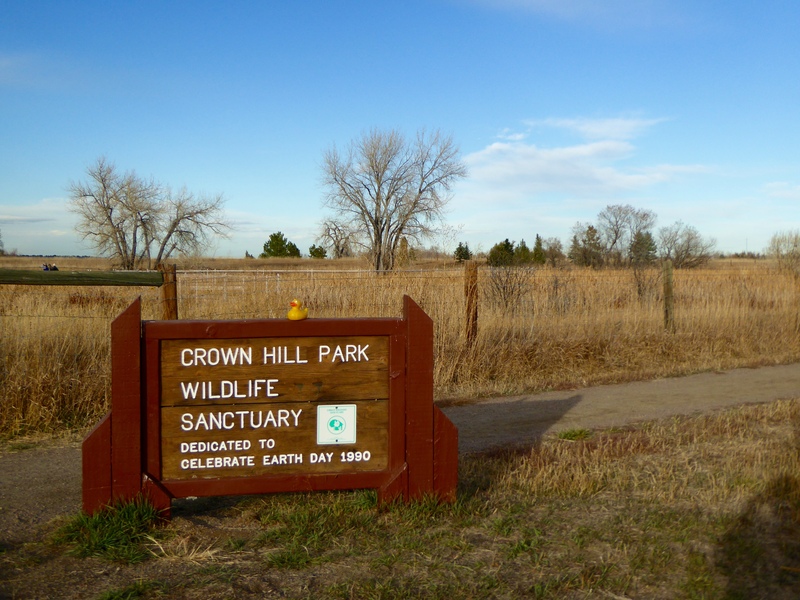 Crown Hill Open Space is a short drive for us, yet it seems so far from the busy lives we all have. 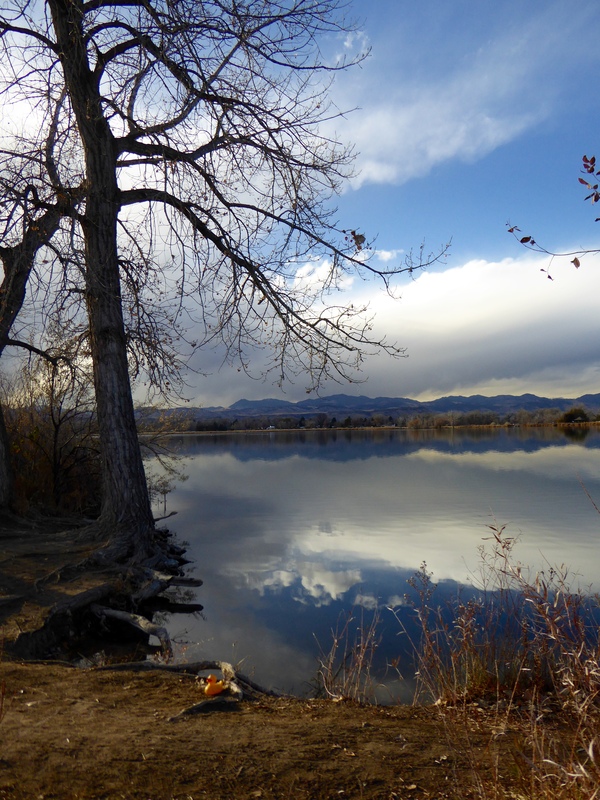 We hope you visit Crown Hill Open Space, or enjoy some pretty parks near you, soon and often. 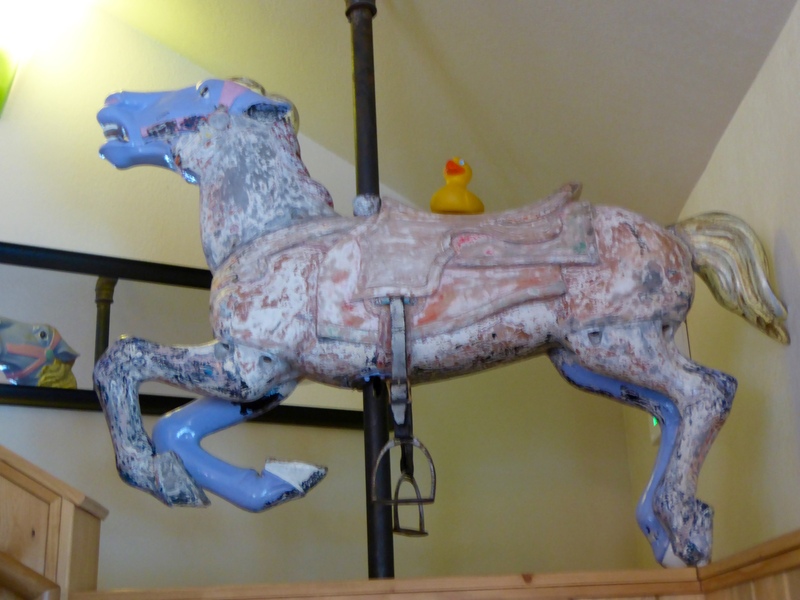 I, Zeb the Duck, went with mom and a friend to The Carousel of Happiness. I love this place. 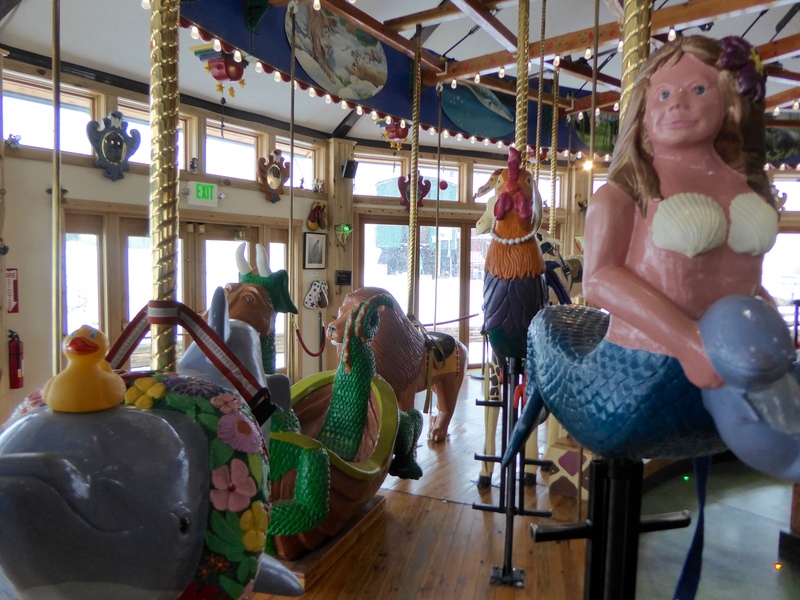 The Carousel of Happiness is in Nederland, Colorado. A couple years ago I told you about this and showed you photos, but it is so great, I want to do it again. It was a snowy day and the roads had more ice under the snow than we expected, but everything was fine and we had fun. Let’s go inside! Tickets to ride are only $1. But donations are gratefully accepted. 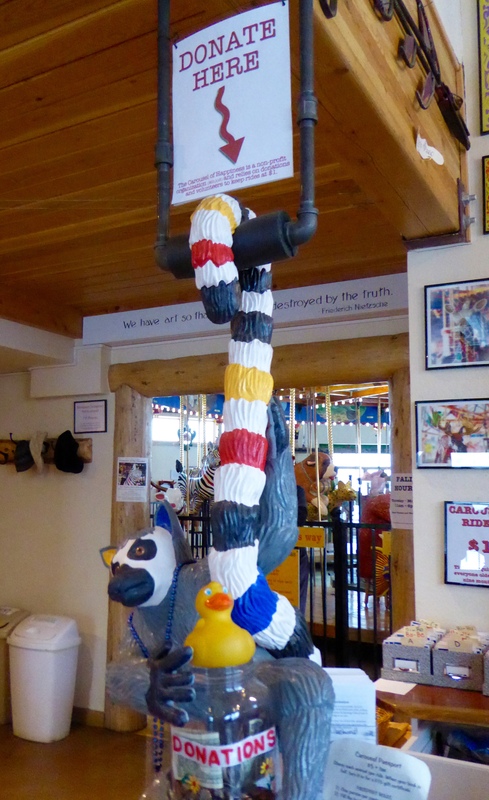 We love this carousel, so we donate. 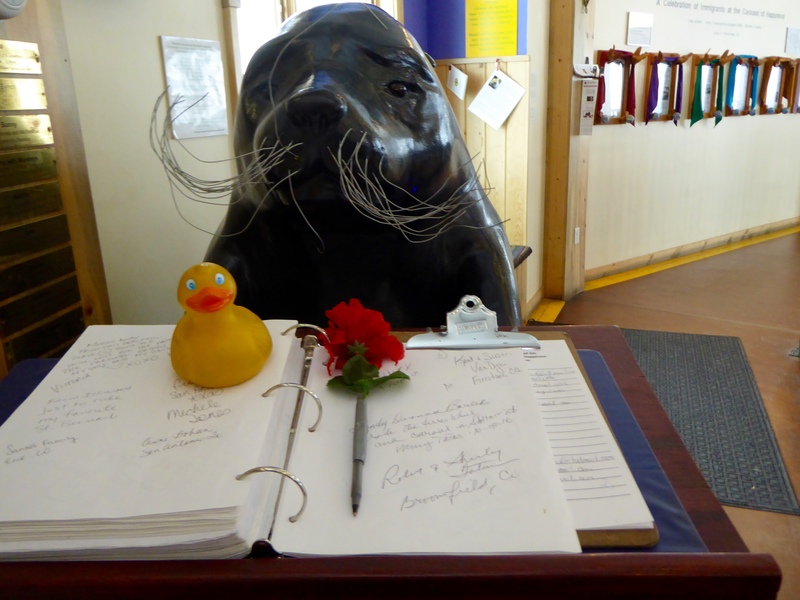 Entering the carousel area, we are greeted with a guest book. 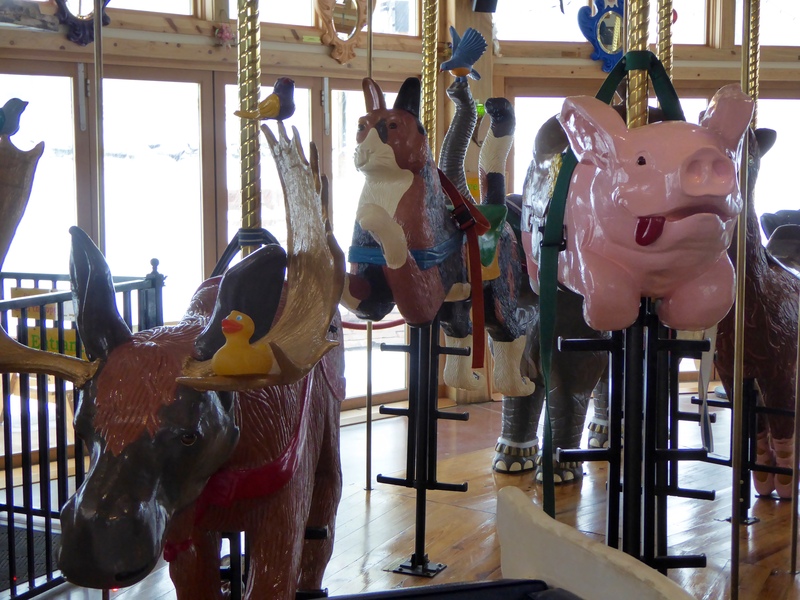 Have you ever seen a moose on a carousel? Or a flying pink pig? I am on the moose, near a pink flying pig. Here they are. When Scott Harrison was a young US Marine in Viet Nam, he received a music box from a friend. Listening to the music, he visualized a carousel in the mountains. 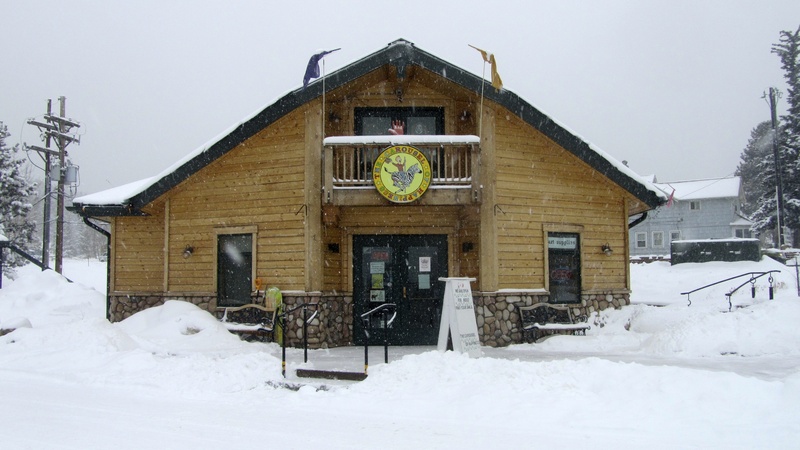 He moved to Nederland, Colorado, a small town in the Colorado Rocky Mountains. He learned how to carve, and look what he carved. I, Zeb the Duck, am riding a dolphin, next to a mermaid. Scott carved all of these animals. The main carousel animals, the small birds and other animals, the carvings decorating the carousel, and this room, all carved by Scott. The carousel came from Utah. Here I am on a lion. Don’t you love the rooster with pearls? That giraffe has a snake riding on him. Puff the Magic Dragon is also here. The rides cost only $1 so all can ride. See this gorilla? The chair next to him can be removed. Under the chair a ramp can be pulled out to allow wheelchairs on the carousel. Anyone in a wheelchair can sit and ride next to the gorilla. 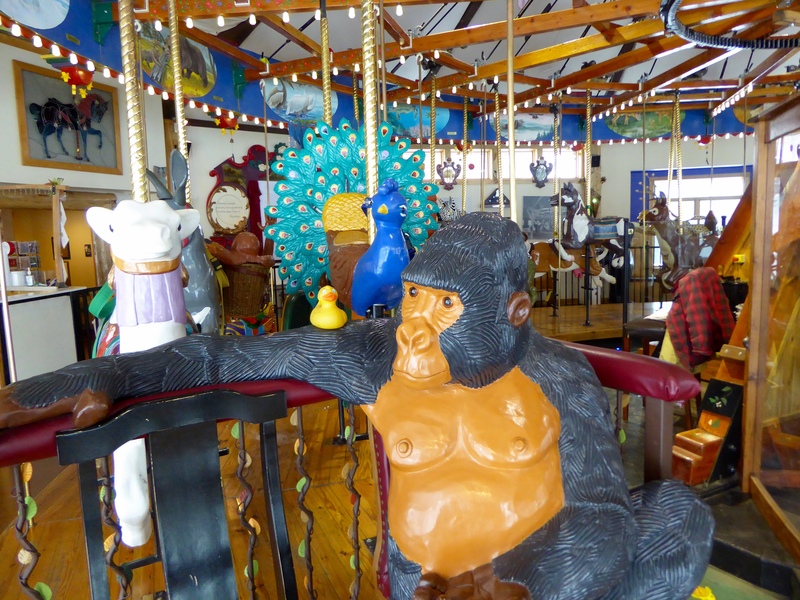 This carousel is suspended from the ceiling, it is not sitting on the floor. 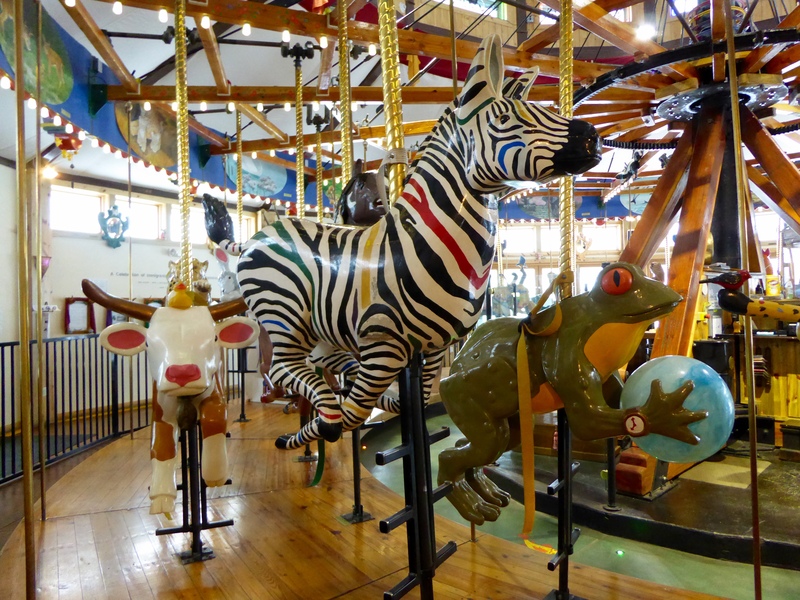 When the animals were placed on the carousel, weight and balance factors were important. Scott is still carving. Scott keeps carving and we are happy! These animals are just for fun. And I, Zeb the Duck, think they are all fun. While riding the carousel, we enjoy the music from a fully restored 1913 Wurlitzer Organ. 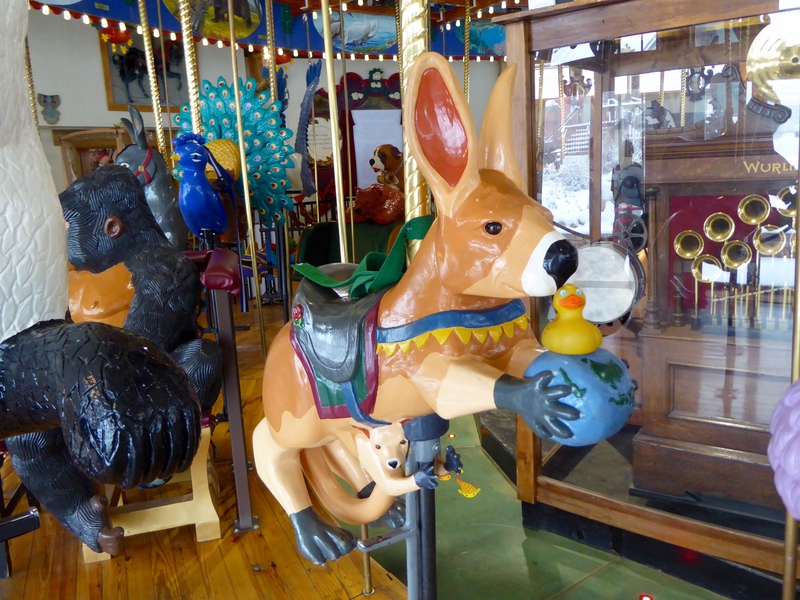 This is the first kangaroo I have ever seen on a carousel. And she has a baby, a joey, in her pouch. The kangaroo is holding the world in her front feet, and she is showing her home, Australia, to us. Every animal is my favorite. A frog with a ball, a zebra and a cow are all together here. This Carousel of Happiness is fabulous, but there is more. 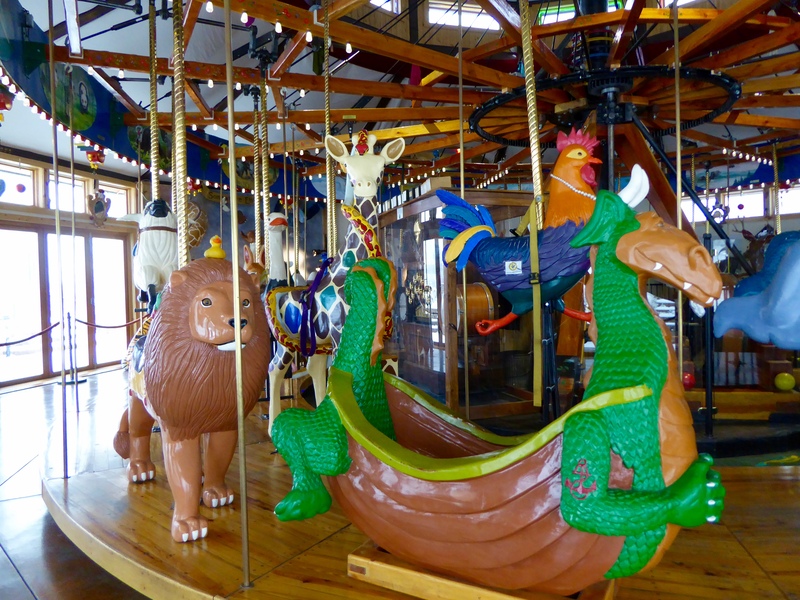 John has been telling us about this carousel, and now he says we can see more. We go upstairs. On the stairs we are reminder of normal carousel horses. I like the horse, but the other animals have my ducky heart. Wow! 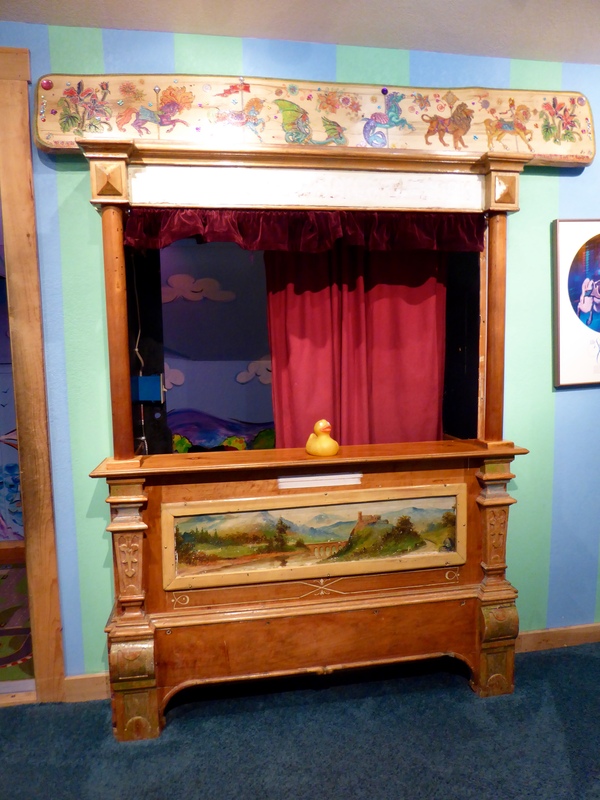 A puppet theater. 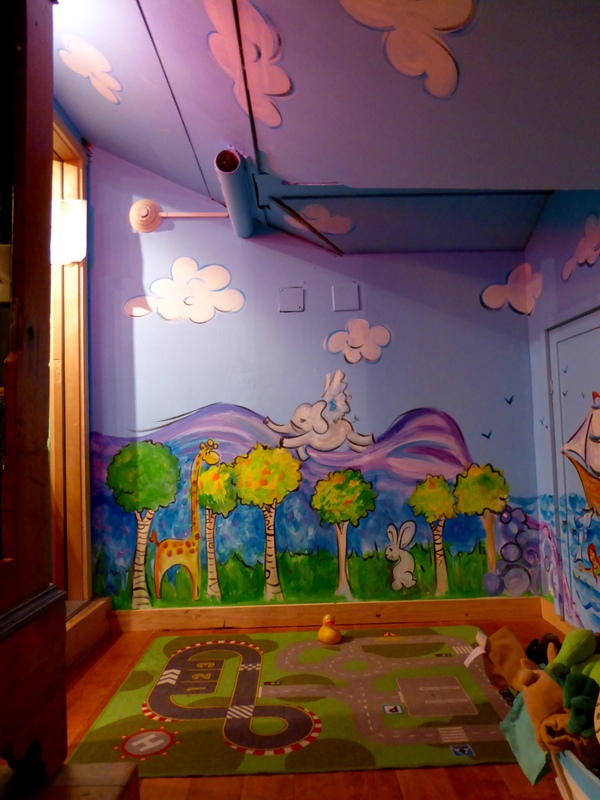 And inside is a place for human kids to play. Humans can reserve this area for kids parties. 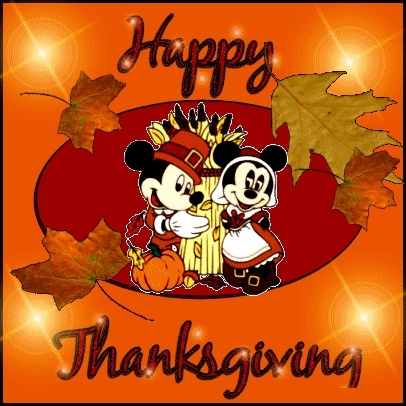 For more information visit http://www.CarouselOfHappiness.org And, visit Nederland and The Carousel of Happiness, take a ride and have a marvelous time. 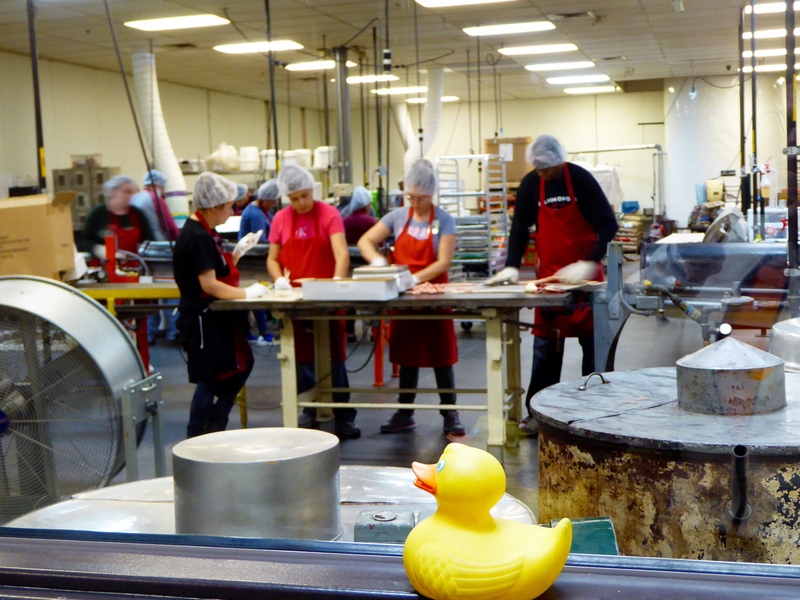 I, Zeb the Duck, took a tour of Hammond’s Candy factory with mom and her friend. Carl Hammond, Sr. worked as an apprentice in a Denver candy factory. When he was ready, in 1920, he founded Hammond’s Candy. His motto was “Nothing is More Important than Quality.” That may be why Hammond’s is still in business and was even profitable during The Great Depression. 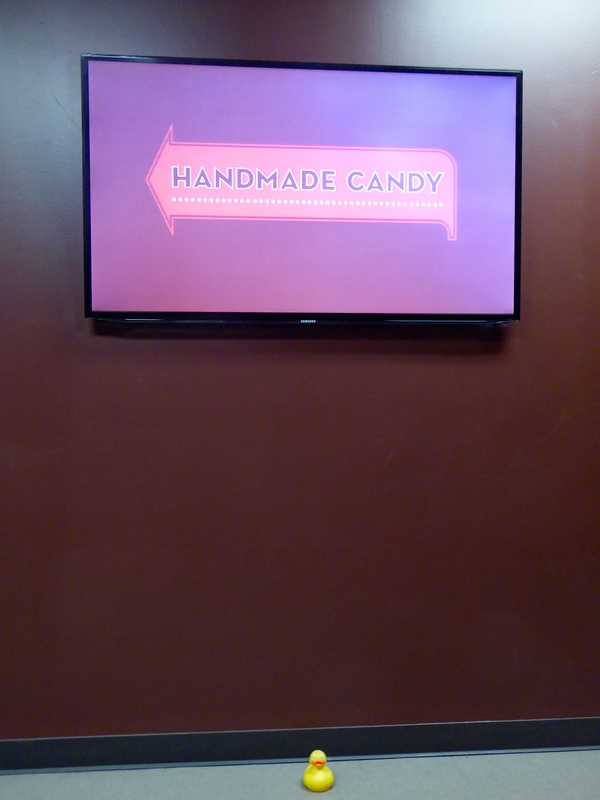 When we arrived, Ginnie showed us to the first room where we watched a video about the beginning and growth of Hammond’s Candy. 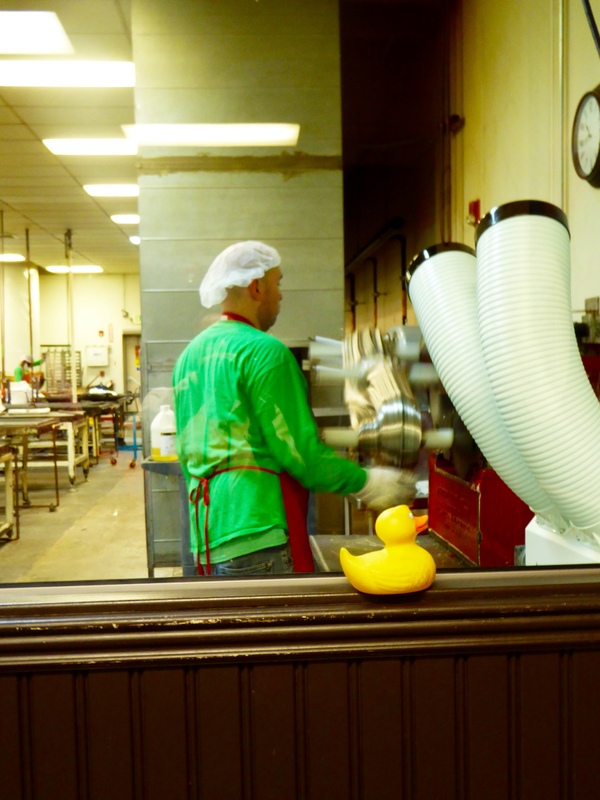 After video, we watch candy being made. Next, Nina led our tour. First stop was watching the candy being cooked. Candy is cooked to 324 degrees F in copper kettles. 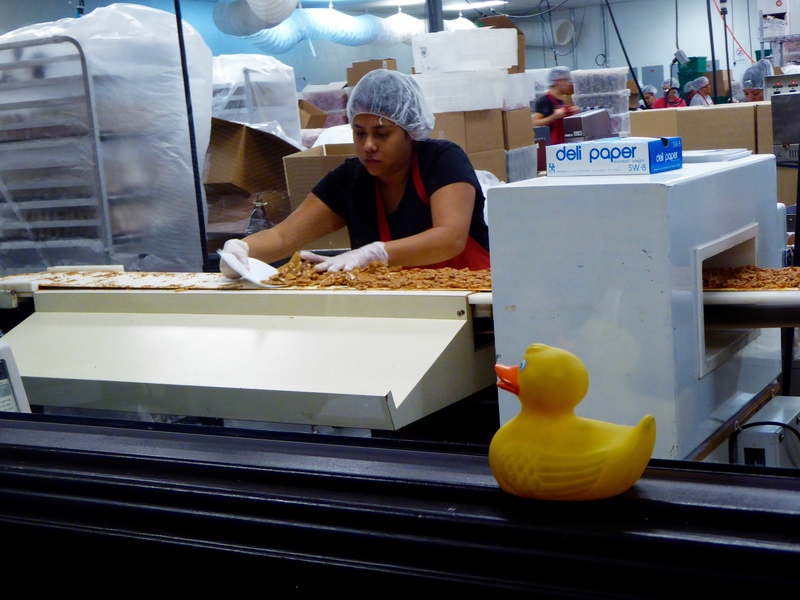 One candy maker makes an entire batch of candy. First cooking the candy, then pulling the candy. The filling for candy canes is flavored. 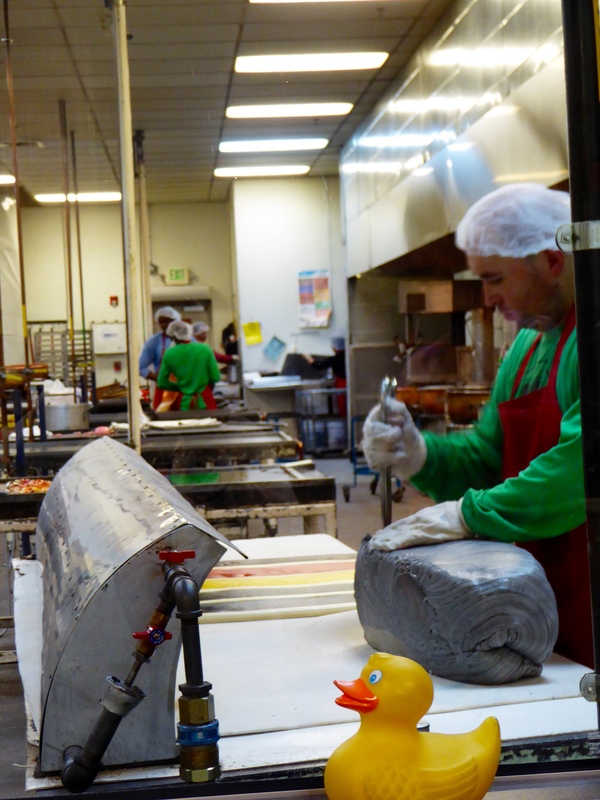 The gray block is flavored filling for candy canes. 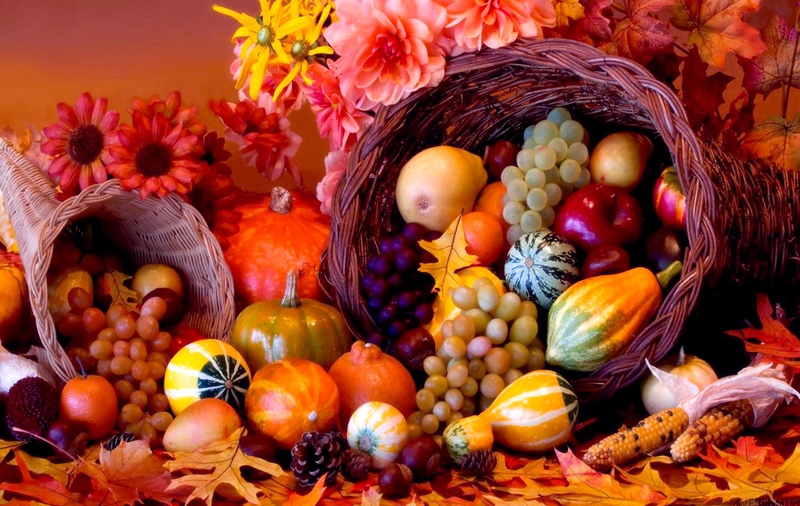 The colors on the table are the outside of candy canes. 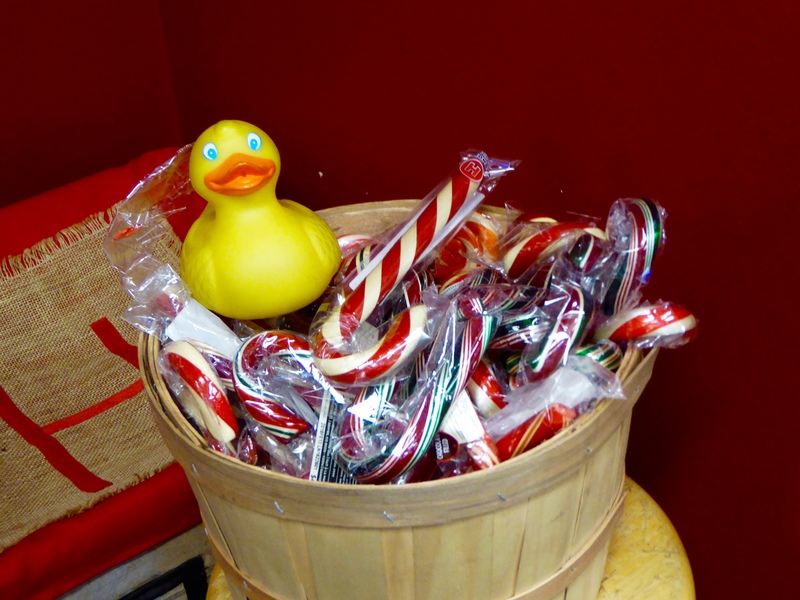 Assistants help with cutting and filling candy canes, but the candy maker is the overseer of that batch of candy. Scissors, not knives, are used to cut the candy canes. The scissors finish the bottom of the candy cane better than a knife could. 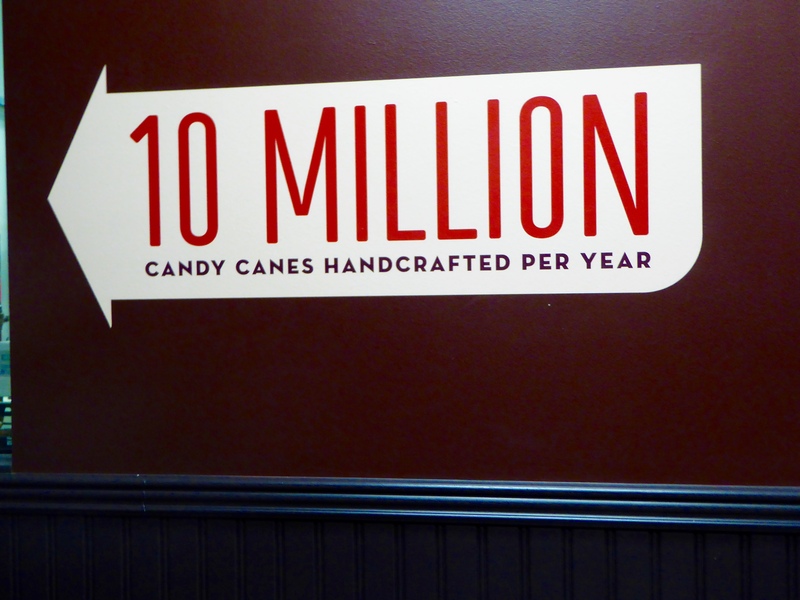 As this sign reminds us, Hammond’s Candy makes a lot of candy canes. 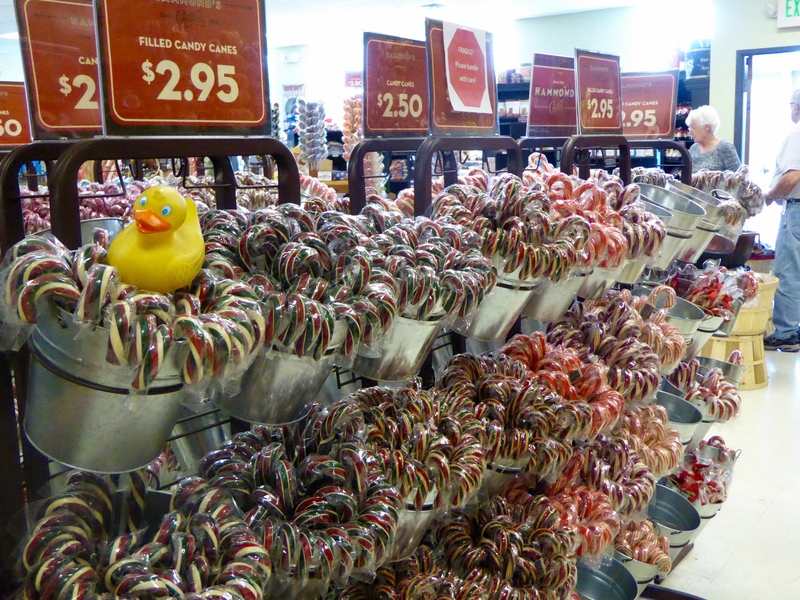 Christmas candy is made many months of the year and kept in climate controlled rooms to keep everything tasting fresh. 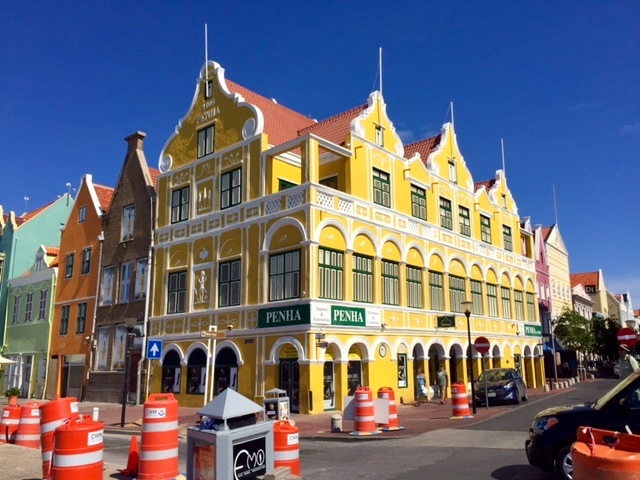 Hammond’s Candy was owned by the Hammond family until 1999. The company was sold again in 2007 and is now owned by the Andrew Schuman family. Hammond’s now makes peanut brittle. This factory sure smells good! Here are some Christmas tree lollipops being boxed for later distribution. 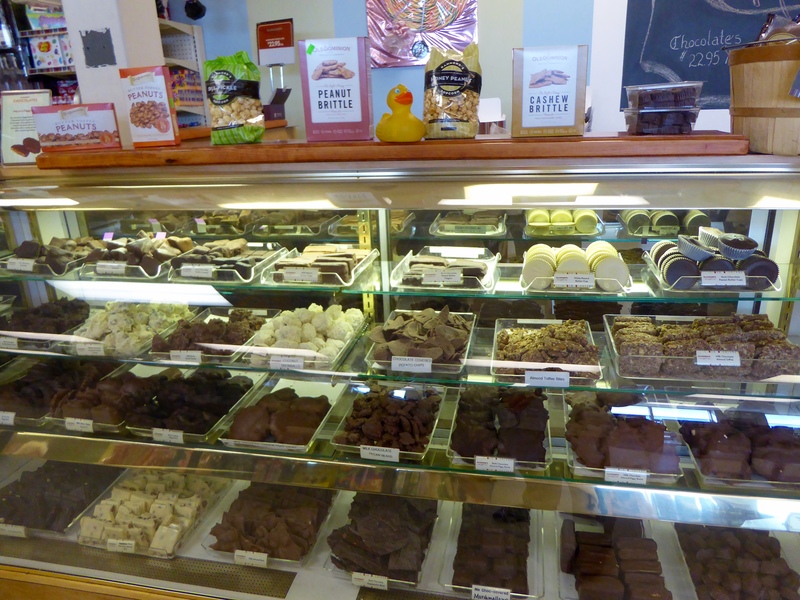 Hammond’s Candy also makes chocolate candy. 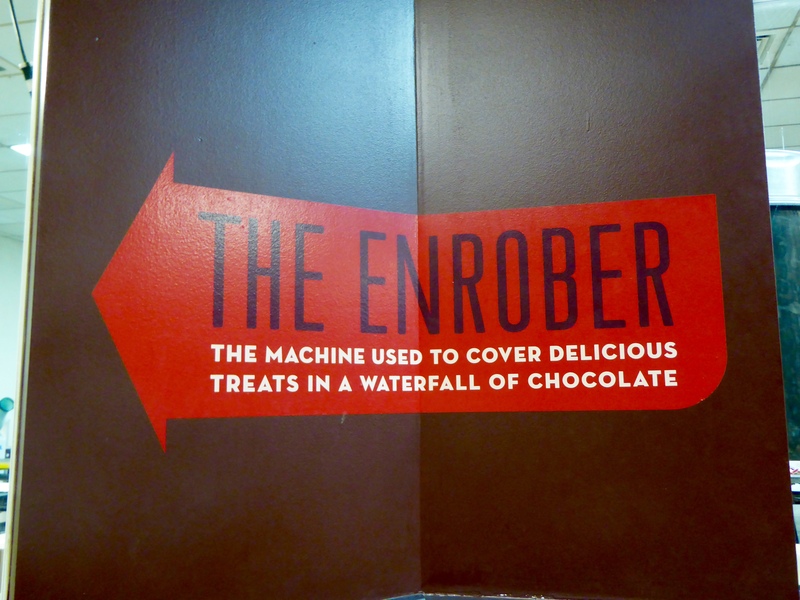 But, they were not making chocolate candy the day we visited. This was a very nice and very informative tour. 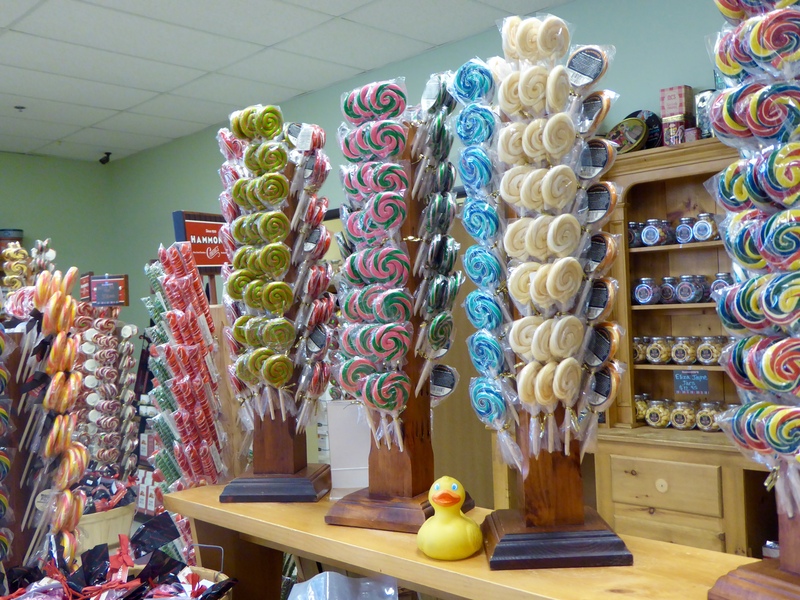 Hammond’s Candy is the oldest and largest producer of handmade hard candy in the country. 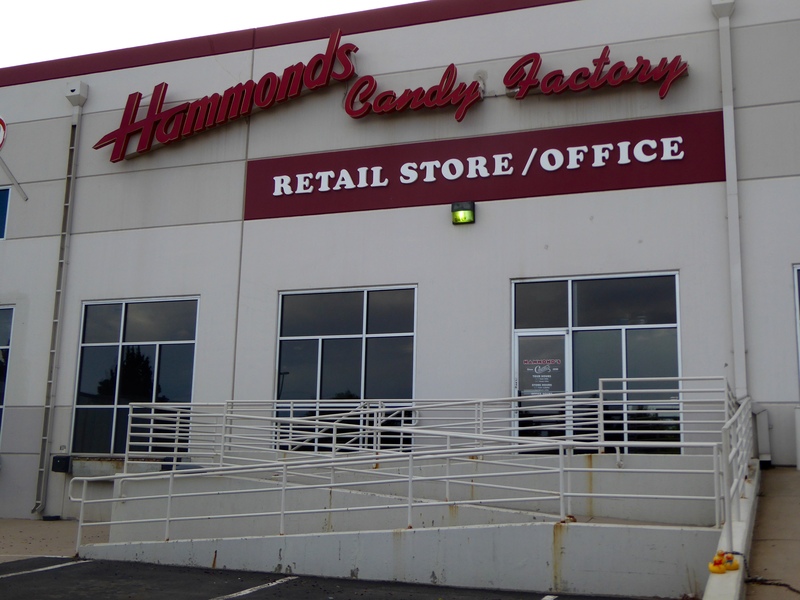 All Hammond Candy is made at this factory, in Denver, Colorado. 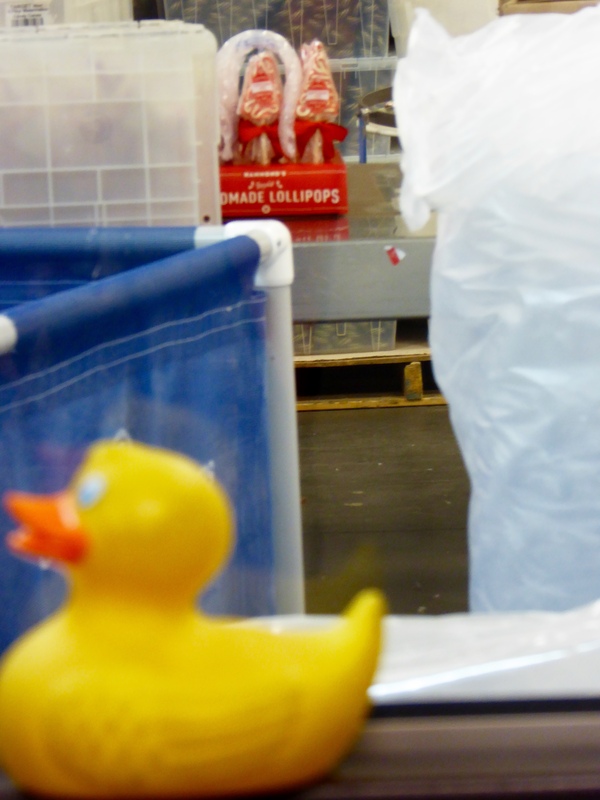 The candy is shipped all over the United States and into several foreign countries. At the end of the tour, we were offered a complimentary sample. They all look so good, it is difficult to choose. Then we went into the retail store. We love caramel corn. Look at all these candy canes. There are so many flavors. And the lollipops. 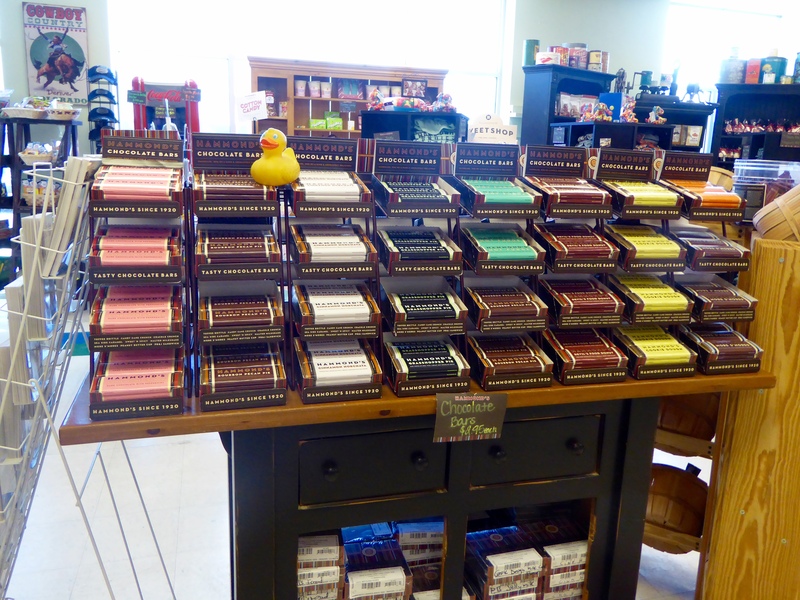 I love being a kid duck in a candy store. 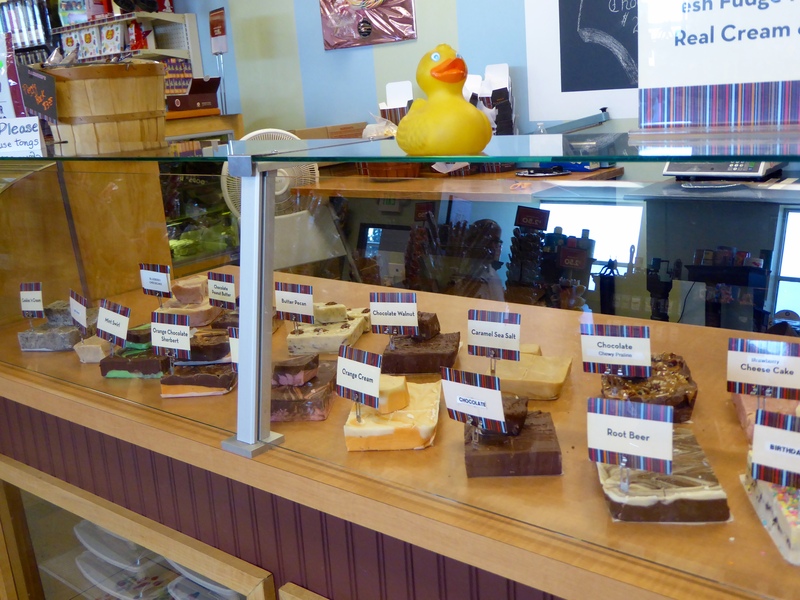 There was a display case of handmade fudge. We sampled chocolate mint swirl fudge. Yum! And the chocolate candy case. We wanted to take some of everything home. 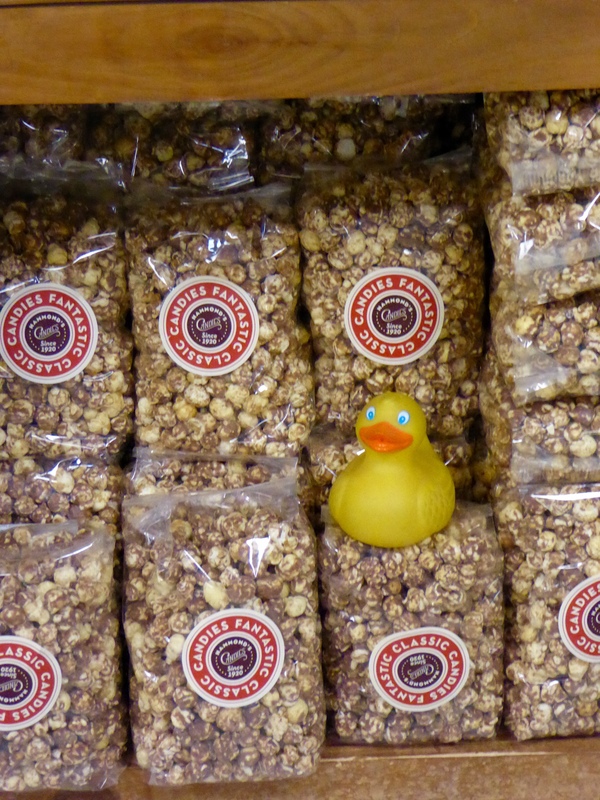 We did buy a lot, but we will share with the rest of the Colorado Traveling Duck family. Here are chocolate bars. 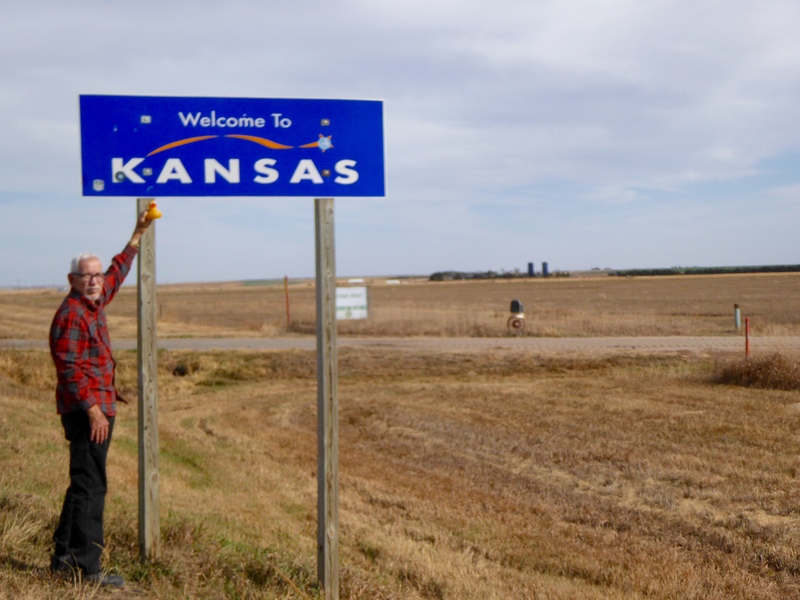 Here we are in Kansas. 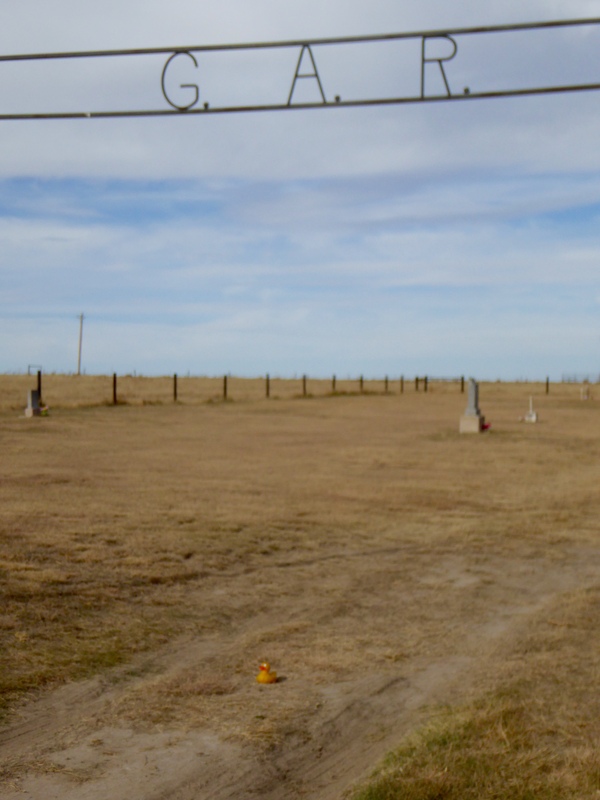 This is the farmland we expect to see in Kansas, but today we are looking for something else. We are looking for the Arikaree Breaks. Driving on US Highway 36 into St. Francis, Kansas, we head north at the courthouse. The humans are following the self driving tour of the area. First stop is the G.A.R. Cemetery. The east half was to be for Grand Army of the Republic veterans and their families. These are veterans of the United States Civil War. 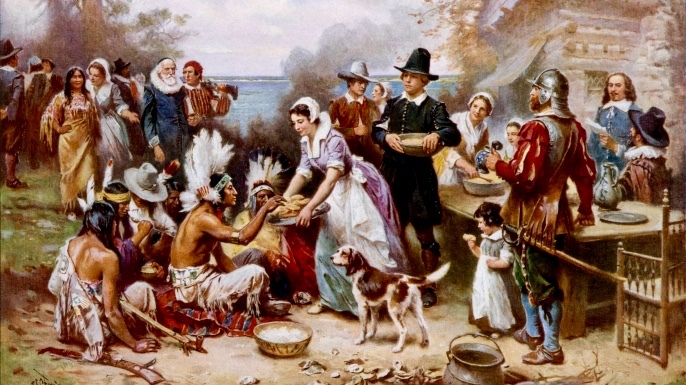 The west half was for citizens and their families. No lots were to be sold; only a donation for the deed was taken. The intention was to provide an honorable burial to destitute veterans of the Civil War. 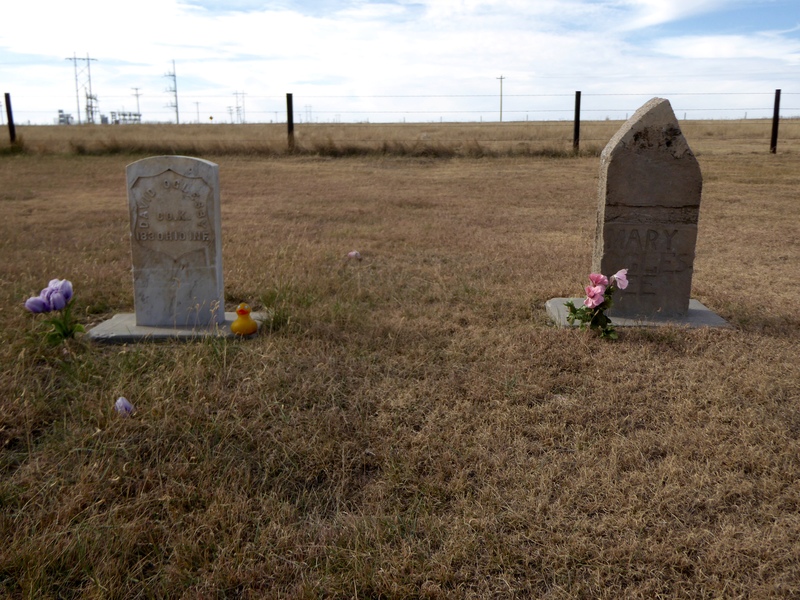 This cemetery was established in 1889. Our map led us over 4 creeks, most of which were dry. Next stop was Horse Thief Cave. 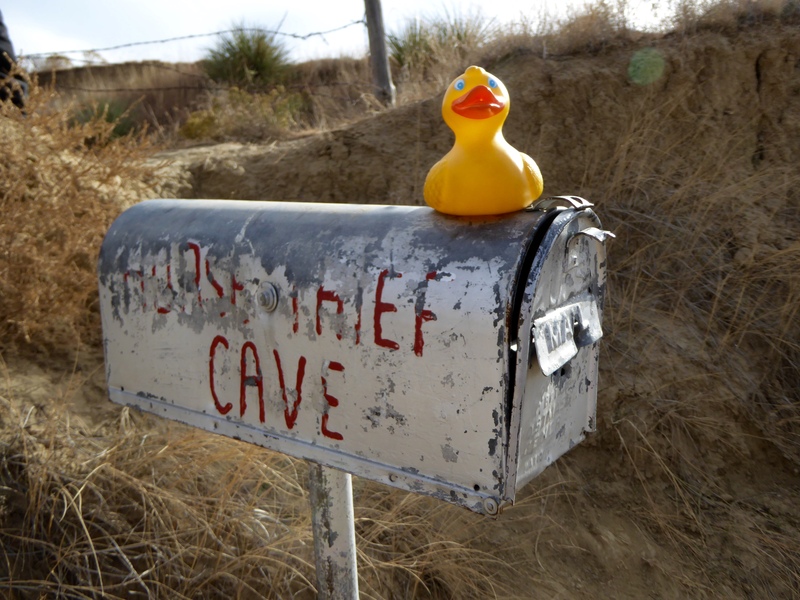 Along the side of the road, near the entrance to Horse Thief Cave was this mailbox. A mailbox for Horse Thief Cave? Why a mailbox? Who receives mail here? I, Zeb the Duck, have no idea. This is the back of the cave. Where is the rest of the cave? Wait a minute. What happened here? Our map tells us most of the cave has caved in, leaving only the entrance. When the cave was last used in 1878, there were 2 rooms back here. The outlaws used the front room as their living quarters. 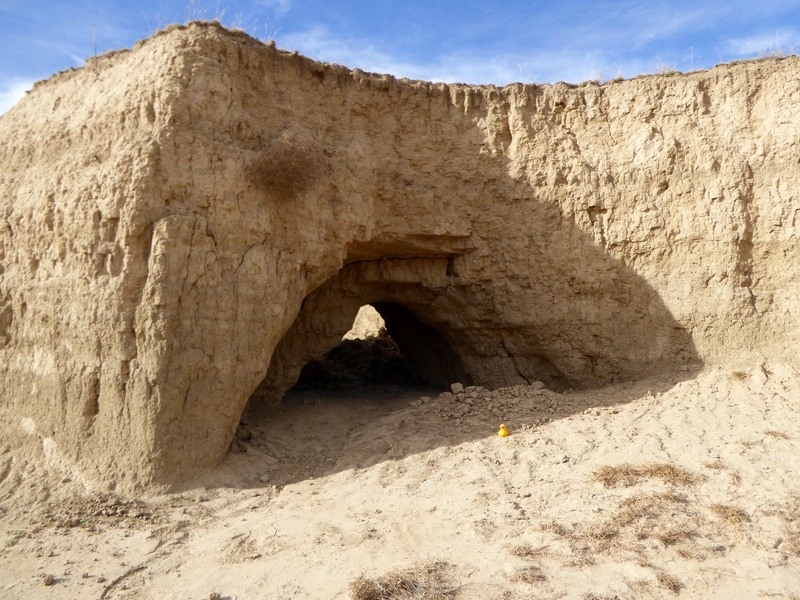 There was a large back chamber where the stolen horses were kept. Looking behind the cave, this is certainly not the flat Kansas farmland we expected. Driving further, we find the Lookout Point. This is a canyon. It is beautiful in its own way. These Arikaree Breaks are 36 miles long and two to three miles wide. They are really great to see. Further along, we are reminded that this really is farm country. The cows are grazing in the breaks. They get in and out of the breaks on their own. Information from the nearby city of St. Francis tells us about this area. The Arikaree Breaks were formed by wind deposited sand, silt, and clay particles, called loess. 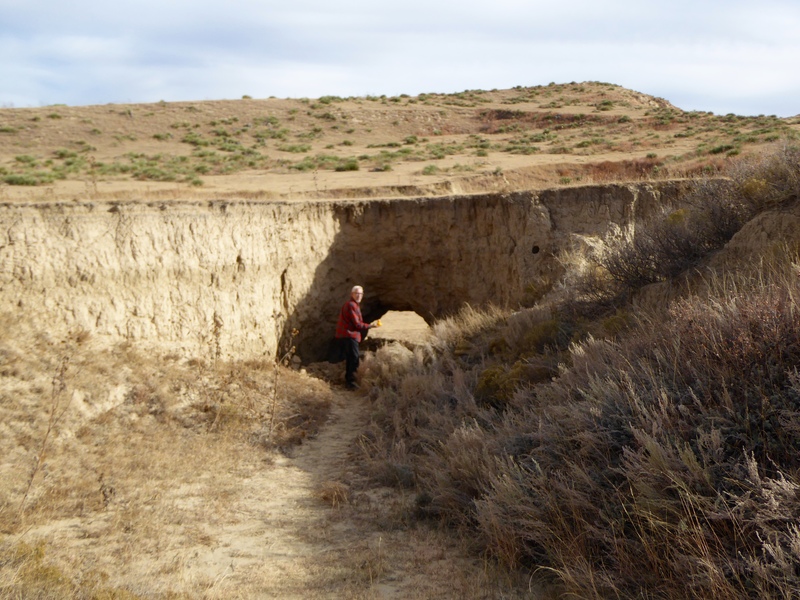 After deposition, the loess has undergone spectacular processes of head cutting, and sidewall cutting the advancing tributaries of the Arikaree River and the South Fork of the Republican River. 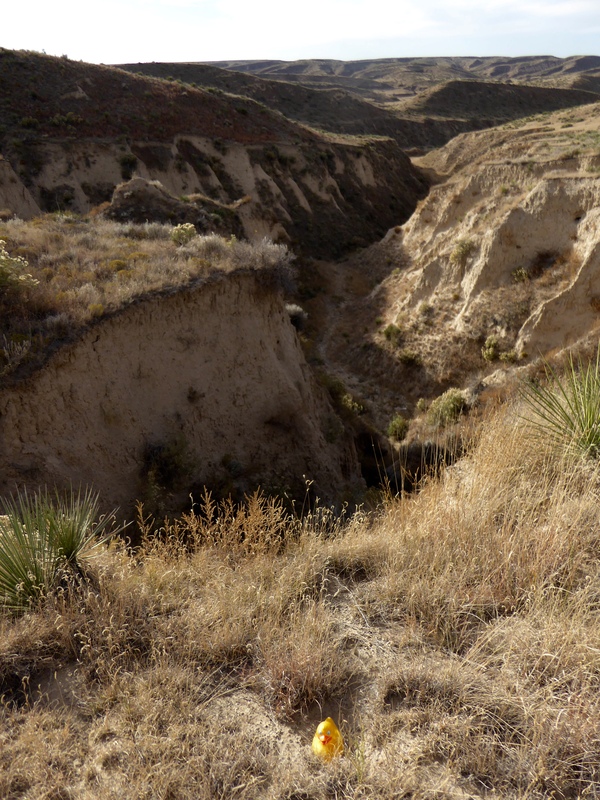 This all happened during the Holocene Age, a little less than 9,000 years ago. The humans tell me we will drive through a private farm, with permission from the farmer, to see 3 corners. I really don’t know what that means. But, along the way, I see two new friends watching me. 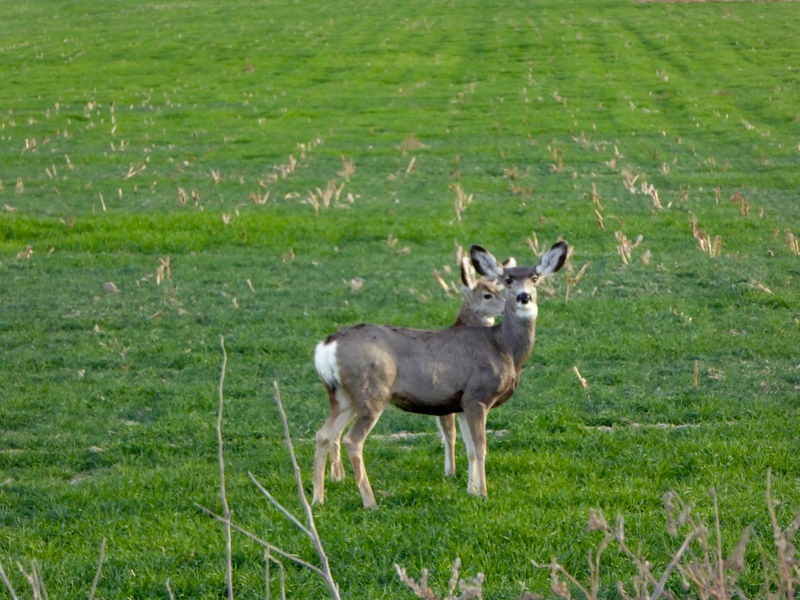 I love to see deer. We also saw a large flock of wild turkeys. They humans tell me 3 corners is where 3 of our states all meet. This is the sign explaining everything. 3 Corners. 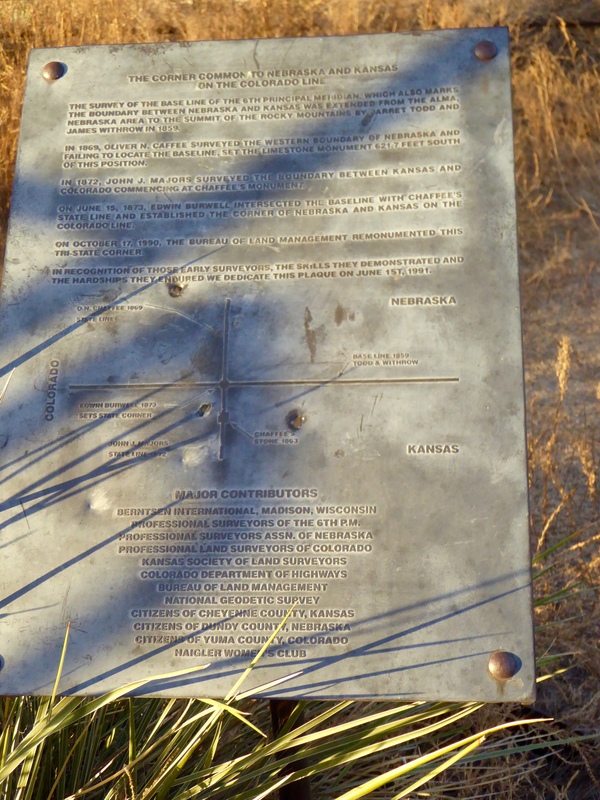 Meeting of Kansas, Nebraska, and Colorado. We are in Kansas, Nebraska is directly north and Colorado is on the east. Here I am where these three states meet. 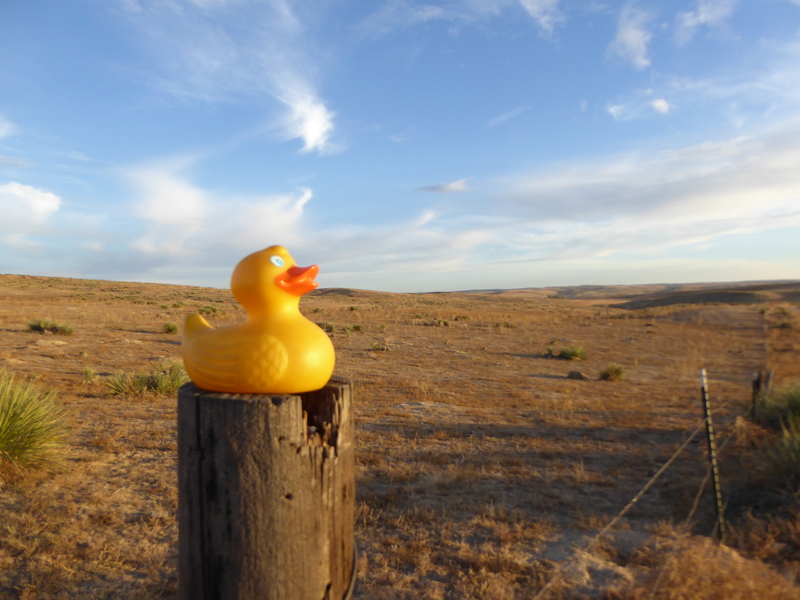 This is a great marker and I, Zeb the Duck, am glad to be here. I wanted to sit on the fence post to gaze over these three states. Observing 3 states. Getting flatter in all directions. 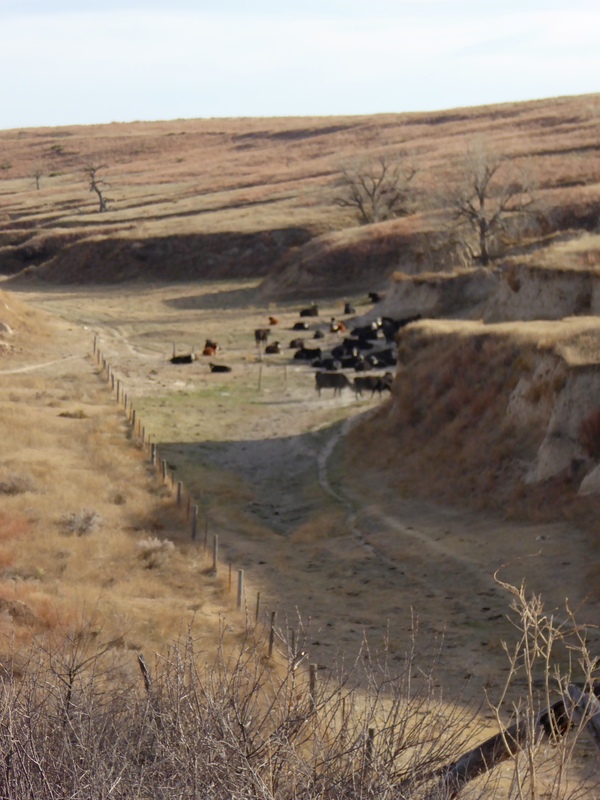 You can see that the land is getting flatter, the typical land of Western Kansas, Western Nebraska and Eastern Colorado. 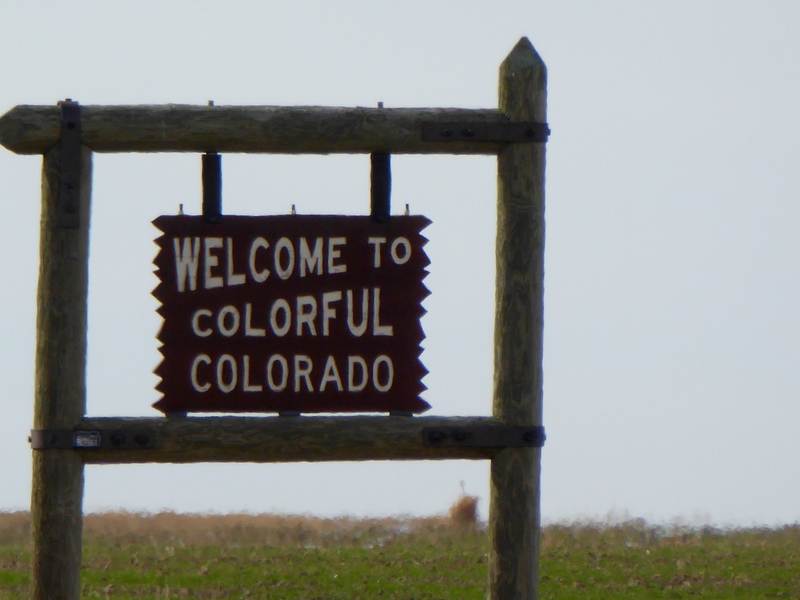 We are heading back to Colorado now. It is always good to go home. On the drive back, we reflect on the Kansas landscape we saw. We really did see this in NW Kansas. Badlands? 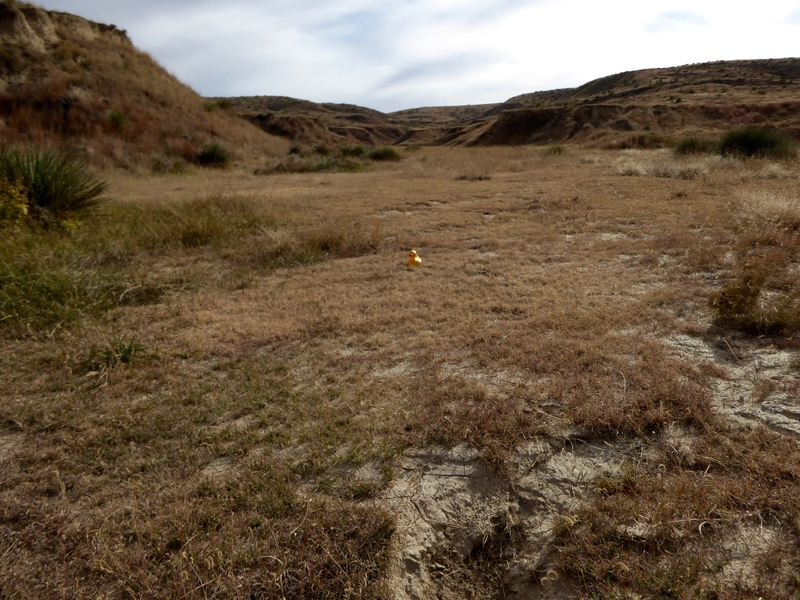 This looks more like the Badlands of North and South Dakota, but it is the Arikaree Breaks in Northwest Kansas. We hope you drive around your area and see some surprising features also.